Instructors – Senseney Music, Inc. Guitar, Bass, Ukulele, Mandolin, etc. Mitchell received his associate’s degree in music performance from Hutchinson Community College in 2018. He played in The Hutchinson Community College Combo, Big Band, and Lab Band and occasionally fills in for HCC shows. Mitchell has had formal training in Jazz, Blues, Rock, Bluegrass, Classical and Metal, and plans on going to WSU for music production next year. He studied his instruments under Randy Key, Nick Schroeder, Matthew Cash, Michael Engdahl, and William Flynn. Mitchell has written music for and played in musicals, and plays every Sunday at Grace Presbyterian Church. He also performs with his bands, Community Theatre (Rock) and Yogi Bogi (Jazz Rock). 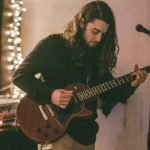 You can find his music on Spotify, Youtube, Bandcamp, and other platforms if you are interested in hearing his style of playing. Calvin has been playing mandolin since the 1970’s. 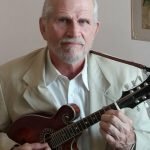 While trained primarily in the classical style of mandolin techniques he has a broad knowledge of music and applies that knowledge in his lessons. Calvin’s primary goal in any set of instructions is to determine precisely the current abilities and desires of the student. Once determined, Calvin works with the student to expand their knowledge and abilities at a pace with which the student is comfortable. Setbacks are handled with patience and care always returning to the basics of good mandolin technique as the mainstay of solid progress. Calvin has composed and published several musical collections written for both the mandolin and violin specifically: A Baker’s Double Dozen of Modern Mandolin Solos and A Baker’s Double Dozen of Modern Violin Duets. Chloe earned her bachelor’s degree in clarinet performance at Emporia State University. She started piano at the age of seven, clarinet at ten and guitar at fourteen. Chloe participated in marching band and symphonic wind ensembles at Emporia State University. She also played in the Emporia Symphony Orchestra for three years. In 2016 she performed with the Emporia Clarinet Choir at the International Clarinet Association conference in Lawrence, KS. Chloe has been teaching at Senseney Music since November 2016. Drew graduated from Friends University in 2013, earning both a Bachelor of Arts in Music and a Bachelor of Music in Guitar Performance, with an emphasis on classical guitar. He has performed as a soloist with the Friends University Chamber Orchestra. 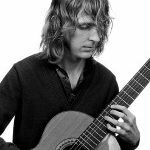 In 2012 he won the Koch Cultural Trust Enabling Grant, which allowed him to travel to Edinburgh, Scotland to study classical guitar improvisation after graduation. Since returning to the United States, Drew began working at Senseney in 2014 and has gained experience working with students of all ages and musical backgrounds. In late 2015, Drew released his own Method book for beginning guitarists, and continues to release educational materials and performances on his YouTube channel every week. Drew is also an active performer in Wichita and can be found in various venues around Wichita with his project DMFP. Ben is primarily a self-taught musician with a few years of formal training at Wichita State University, where he worked with Mark Foley, Craig Owens, and Tom Fowler. Having known at an early age that music would be a lifelong pursuit, Ben has continued to explore the many facets of playing including helping others find their own artistic voice. From his involvement in many musical projects and collaborations, and through playing a wide variety of styles both in guitar and bass, he has developed a deep richness in his approach to rhythm, melody, and improvisation. Recent recording projects include: “Sky Meets Earth”; “Morning”, Rudy Love; “Infinite Love”; and “Blues in Ballet.” Ben has been teaching at Senseney Music since 2007. Laura received her Bachelor of Music in Education/Instrumental at Wichita State University in 1996. After receiving her degree she taught lessons at Senseney Music and then at Stubbs’ Music Center in Tallahassee Florida in 1999. Since 2003, she has taught in her own studio as well as Senseney Music and Musical Offerings in Derby, KS. She is organist/pianist and director of Atonement, an instrumental ensemble, at Covenant Presbyterian Church. Laura was the El Dorado Middle/High School Choir accompanist for the 2016/17 school year. In addition to her organ/piano duties, she also plays clarinet and bass clarinet with the Senseney Music Community Band and the Delano Wind Ensemble. 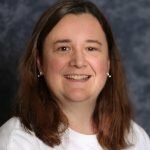 Laura is a Nationally Certified Teacher of Music by Music Teachers National Association and is also a Licensed Kindermusik Educator. Rosemary graduated from Friends University with a music education degree and a piano performance degree; she performed two piano recitals for her degree fulfillment. Rosemary has been a church musician for most of her adult life, serving as accompanist, singer, and director. 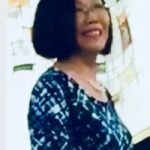 Since 2002 she has been staff organist/pianist at University Friends church. In 2008, she performed a mini-recital for the rededication of the University Friends organ. 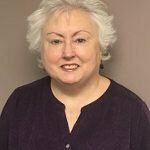 Rosemary has been teaching piano at Senseney Music since 1999. Melissa began piano lessons at the age of 5 in the city of Kuala Lumpur, Malaysia. At the age of 16, she completed her Diploma with the Associated Board of the Royal Schools of Music. Her education in music continued with an emphasis in Piano Pedagogy at Wichita State University, where she completed her Bachelors and Masters Degrees, under the tutelage of Dr. Sylvia Coats and Dr. Julie Bees. Melissa was a Graduate Teaching Assistant and Adjunct Faculty for Wichita State University. She is a Nationally Certified Teacher of Music in Piano (NCTM). Melissa is a trained classical pianist. She plays keyboard with her church’s band, and has been teaching at Senseney Music since 2010. Mia graduated from KyungHee University, Seoul, Korea with Bachelor’s and Master’s degree in piano performance. She also received a Master’s degree in piano performance from Emporia State University. 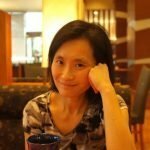 She was a Professor of Music in piano at Soongeui Woman’s College in Seoul, Korea. 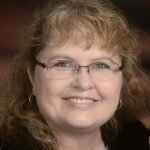 She has been a piano instructor at Senseney Music since 2002 and has served as organist and pianist at Clearwater United Methodist Church since 2002. Mia has performed extensively as keyboardist and accompanist. Quentin received his Bachelor of Music from WSU and his Master of Arts in trombone at the University of Iowa. He taught instrumental music in the public schools for 30 years and taught brass methods at Friends University for 9 years. He is currently playing with the Aerotones Big Band and the Senseney Community Band. Quentin has been teaching brass at Senseney Music since 2005. Guy Vollen is a horn player and composer; he attended Wichita State University and earned a Doctorate in musical composition from Florida State University. He has taught on the faculty of Wichita State University and Bethany College. 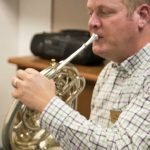 As a horn player, he has performed with the Wichita Wind Ensembles Professional Band, the Pegasus Brass Trio, and at the Crown Uptown Theatre. He currently performs with the Delano Chamber Brass and Senseney Music Community Band. Mily Montanez is currently pursuing a Master of Music degree in Flute Performance at WSU. She has performed with the Symphonic Wind Ensemble and has served as the Co-Principal Flute of the WSU Symphony Orchestra. 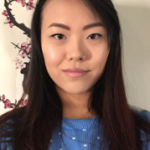 Mily was a finalist for the 2017-2018 WSU Concerto Competition. She has also served as a supplemental flute instructor for the undergraduate Woodwind Methods course. 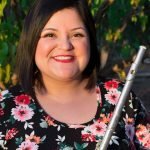 She holds a Bachelor of Music degree in Flute Performance from Texas A&M University-Commerce. At Texas A&M University, Mily performed in multiple large ensembles, both in the instrumental and vocal divisions. Mily has also performed with the Sherman Symphony Orchestra. 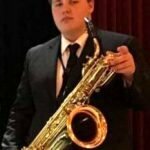 James is currently studying Music Education and Jazz Studies at WSU. He was selected to District Jazz in 2016 and all steel stacks jazz festival band on Baritone saxophone. He is the principal saxophonist for the symphonic band, Shocker Sound, and is the second tenor in Jazz Arts. He has also performed with small ensembles such as jazz combos and sax quartets. He also has over a decade of experience on string bass and was principal bass at the Marywood strings celebration from 2015-2017. 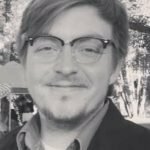 James started teaching at Senseney Music in September of 2018. Asher graduated from Friends University with a Bachelor of Arts in music, emphasizing in trumpet and voice. He has played trumpet for 10 years and performed with various ensembles around Wichita and at Friends. At Friends, Asher performed with the Jazz Vocal Ensemble, the university band, community orchestra, jazz band, and brass quintet. He also acted in plays and musicals. This past February, he performed as Mr. MacAfee in the musical Bye, Bye, Birdie! Asher was also very involved in Singing Quakers and served as their president for the 2016/17 school year. He will be continuing his passion for singing with the Wichita Chamber Chorale for the 2017-18 season. Asher has been teaching at Senseney since June 2017. Tamara Cox is a dedicated violinist majoring in Music Education at Wichita State University. While growing up in the Kansas City area, she was very active in her school orchestra and participated in both Olathe Youth Symphony and Kansas City Youth Symphony. As a member of the Academy Orchestra in Kansas City Youth Symphony, she earned the opportunity to perform at the Kauffman Center for the Performing Arts in Kansas City and performed on the Ireland tour in 2016. She is very passionate about spreading her love of music to others and enjoys the one-on-one interaction that comes with teaching privately. 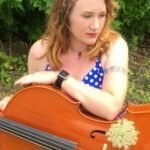 Multi-purpose musician, Roni graduated from Wichita State University with a Bachelor of Arts in Cello Performance. In order of most proficient to least, Roni plays the following instruments: cello, violin, piano, guitar, clarinet, trombone, and accordion. Roni is a singer/songwriter who uses a loop pedal to create all the parts in her musical performances. Over the past several years, she has performed at many Wichita weddings, events, coffeehouses, farmers markets and grocery stores. She has performed as a band member or guest artist with numerous other local musicians/bands. 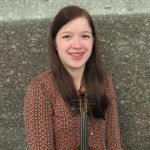 Roni is a cellist in the Newton Mid-Kansas Symphony Orchestra and plans to audition for the Wichita Symphony Orchestra for the 2017/2018 season. She also wants to further her education by obtaining a Music Therapy degree. Her services include but are not limited to the following: private lessons, music therapy, personalized compositions, band member/guest artist, and performances. Sheaukang has a DMA from the University of Oklahoma in violin performance and ethnomusicology. She has an MM in Music History and her BM is in violin performance, also from OU. She teaches music at Butler Community College and regularly performs at church and in local jam sessions. While at OU, she played in the orchestra, music theater and string quartets. She was also a member of the Mariachi band ‘Mariachi Orgullo’. Sheaukang has played for barn and contra dances and in Oklahoma’s Irish/Old-Time music community. She has been teaching at Senseney since 2007. 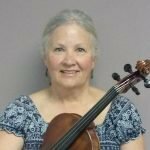 Catherine earned her Bachelor’s and Master’s Degrees in Music Education from Wichita State University and taught orchestra and beginning string classes for many years in Wichita Public Schools. One of her inspirations was Janice Hupp, a fine violist and gifted teacher. Catherine has played in chamber orchestras, theater orchestras, string quartets, church orchestras and recitals. “In my experience, studying an instrument adds another dimension to a person’s life; it expands and enriches your world!” Catherine has been teaching at Senseney for 15 years. Scott Dean Taylor received a degree in Music Performance from Wichita State University. 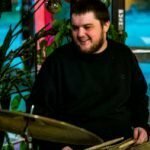 Since then he has been a percussion performer and educator in the Wichita area for 6 years. 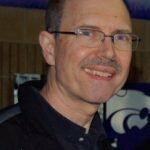 He has been a percussion instructor in the Goddard and Buhler School Districts, and has led concert and marching percussion ensembles to award-winning performances. He has also performed in numerous jazz big bands and small ensembles. In the Wichita area, Scott has performed with such luminaries as Jason Whitmore, Nathan Williams, Rudy Love Jr., Kendall Wohaska, Seth Carruthers and many more. Scott started teaching at Senseney Music in 2016.